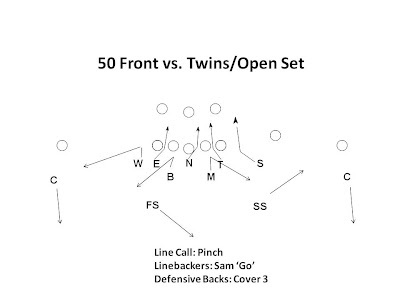 The below diagram shows a "50 front" odd defense against a classic spread offense look, twins/open or 'split' - two back - shot gun set. Linebackers: Will (Weakside backer), Mike (Middle backer), Buck (2nd Middle backer), and Sam (Strongside backer) - In a true '50' look, Will and Sam are line of scrimmage (LOS) players - some may call this a '3-4' look. 'Pinch' call for the 3 down lineman, meaning they are aligning head up to their respective offensive lineman (no shade) and at the snap sliding hard (with penetration) to the closest inside gap, with the Nose Guard (N) always sliding to strength on a pinch call, and weak on a veer call. A 'Veer' call is the opposite of a 'Pinch' call, the alignment is the same (head up), but the defensive linemen would slide hard to the nearest outside gap to them. 'Sam Go', a 'controlled' blitz from the strongside linebacker, wanting to try and time the snap so he has forward momentum. I use the word 'controlled' because based on the down and distance of the play at hand, this could either be a run blitz or a pass blitz, and the last thing you want to do is run by a run play because you blitzed 'out of control'. I always teach linebackers to be run defenders first, they have to have 'forward moving' run stop mentalities, then once pass is properly identified, they need to hustle to their pass responsibilities if they're not blitzing. Important coaches point: the weakside Corner and Will are likely going to be converting to man as the play progresses, but at the snap the Corner wants to show Cover 3, aligning 8-10 yards off the SE as this allows for better run support, as opposed to a backside man lock on the SE.